Do you import goods and need to allocate shipping costs, customs agents’ charges or any other charges to the items being imported to get their true into store cost? • The purchase of the items is entered in the normal way and items that are to have shipping costs allocated to them have the relevant shipment job code entered in the job code column. That enables the user to determine which items are to have freight costs allocated to them. • The freight costs etc are all coded to a specific goods in transit account with the relevant shipment job code entered. This also enables shipment costs to be allocated to multiple purchase invoices if required. 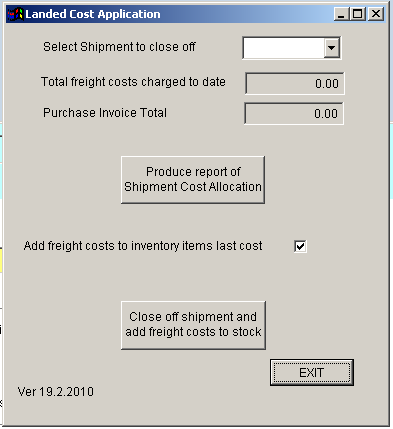 • Then when all shipment costs are entered in MYOB the user select the relevant shipment/job code and the application shows the total freight costs that will be allocated and the original invoice total. • The user can produce a detailed report showing the line by line allocation of the freight costs to the individual line items. • If the user is happy with the allocation they can close off the shipment by clicking on the button and the application automatically adds the freight costs to the current on hand stock value of the items on the original purchase invoice. • If some of the items have been sold since the original invoice the cost of sales account is updated with the additional freight costs. • The user also has the option to update the last cost of items with the freight inclusive cost if they want to. • The job is marked as inactive during the update to prevent further charges being allocated to it in error.